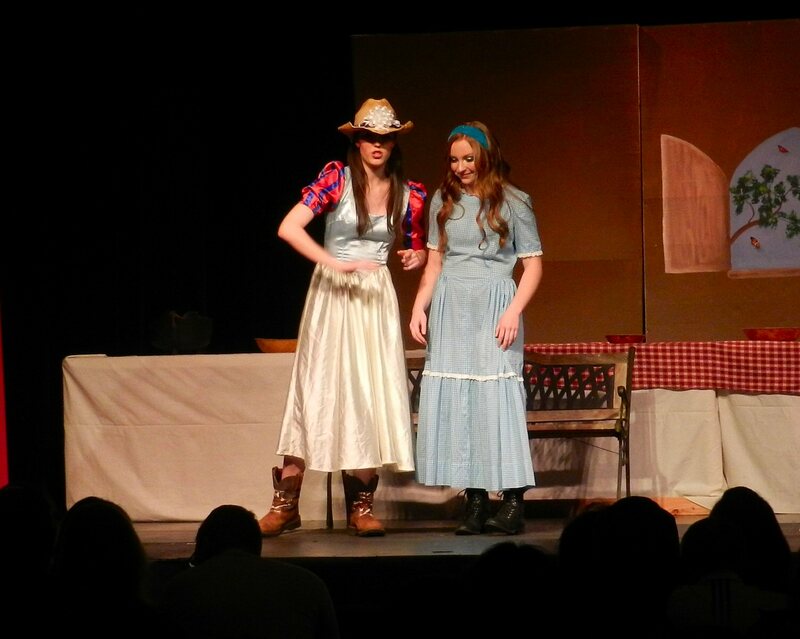 “The 2018 Spring musical was a smash hit! 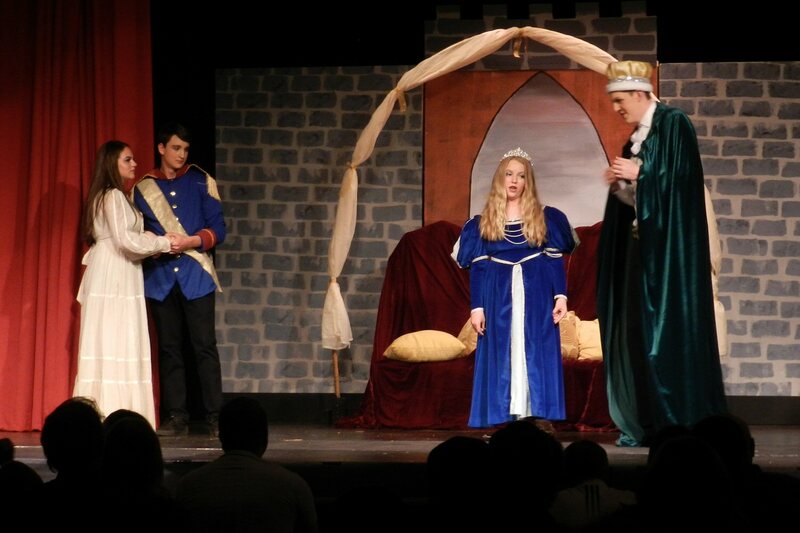 Burney Junior and Senior High School Students presented three marvelous performances of “Princess Whatsername” written by Brian B. Taylor with music by Bill Francoeur and lyrics by Scott de Turk at the Liz Polley Center for the Arts. 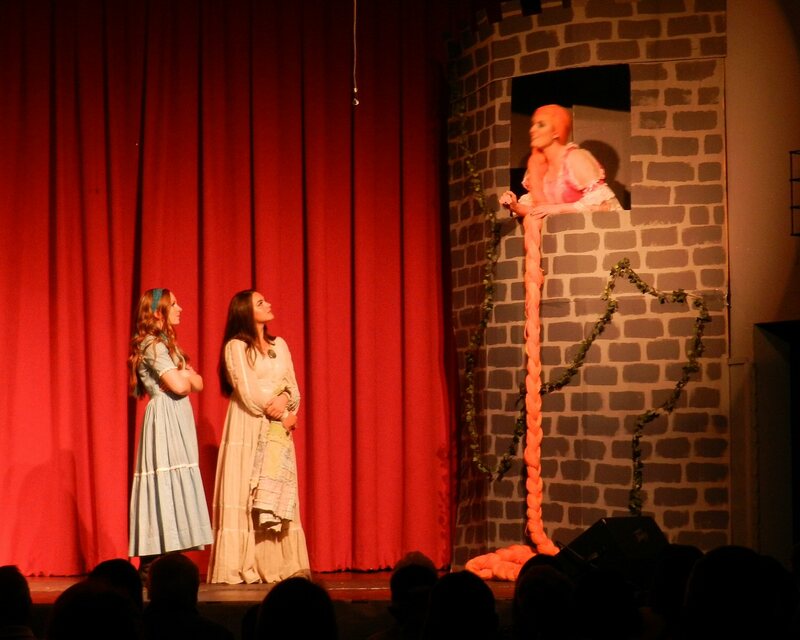 The production was directed by Jill Reed Lights and Sound by Larry Goza and Alissa Tereba and Stage Direction by Carolyn Garrigua and her crew. 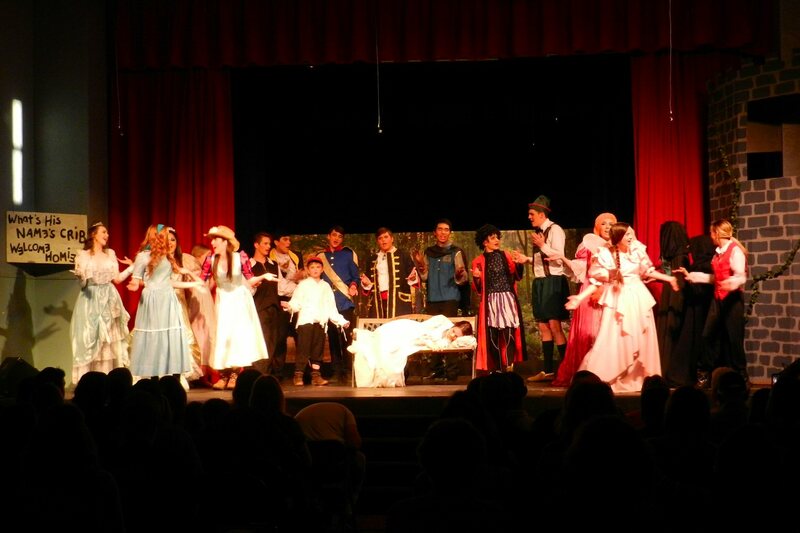 About 400 people came to see the performances that took place on Wednesday, Thursday and Saturday nights. A talented cast of dozens of students took the audience through a cleverly constructed fairy tale peopled with characters from a range of Grimm’s folk tales including Hansel and Gretel, Rumpelstiltskin, Goldilocks and the Three Bears, Snow White and the Seven Dwarves, Cinderella and the Fairy Godmother, Rapunzel, Hercules, princesses and princes, and good and bad fairies. 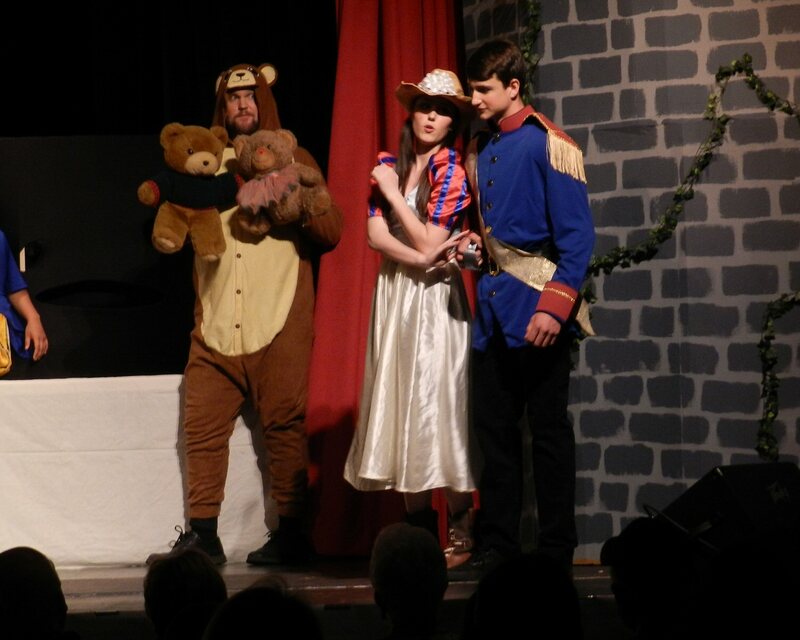 The lead character, Princess Whatsername (played by Bailey Turner) turned out to be Princess Aurora, who had been pricked by a spinning wheel and lost her memory. 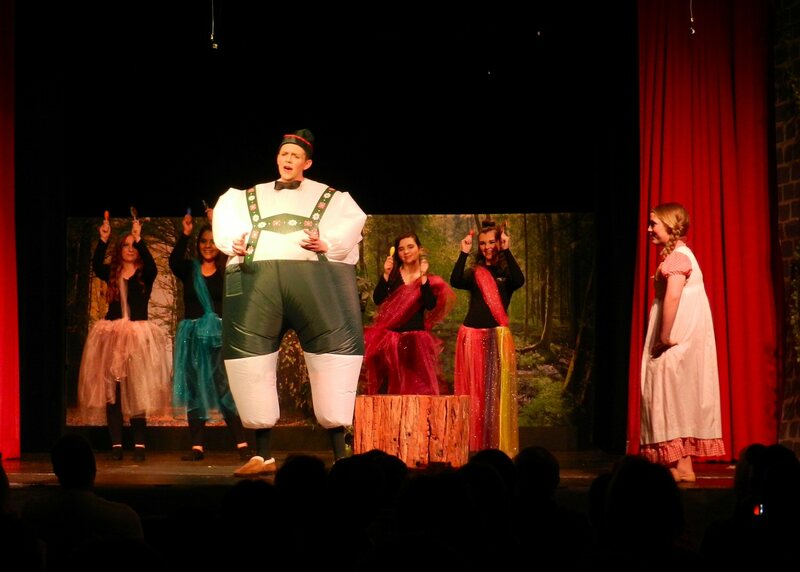 In her quest to regain her true identity, she wandered through an enchanted forest as the characters enacted comic scenes and delightful musical numbers. 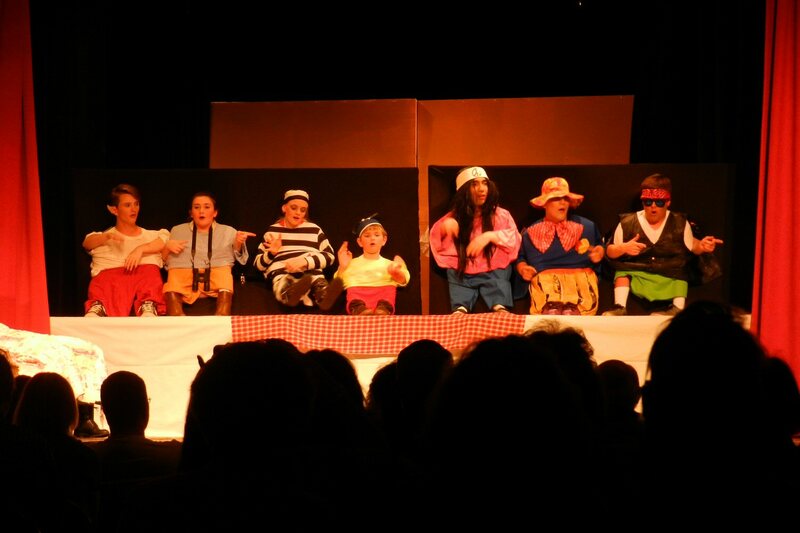 All the students performed excellently. 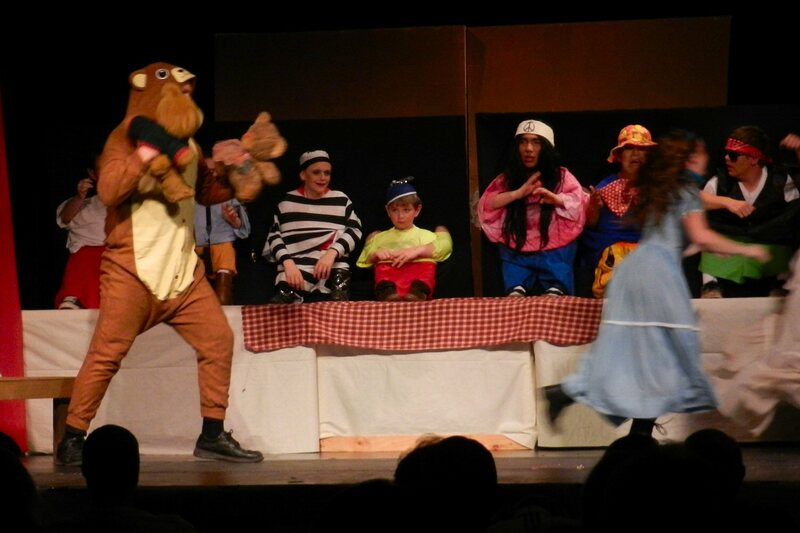 The Seven Dwarves number was classic. 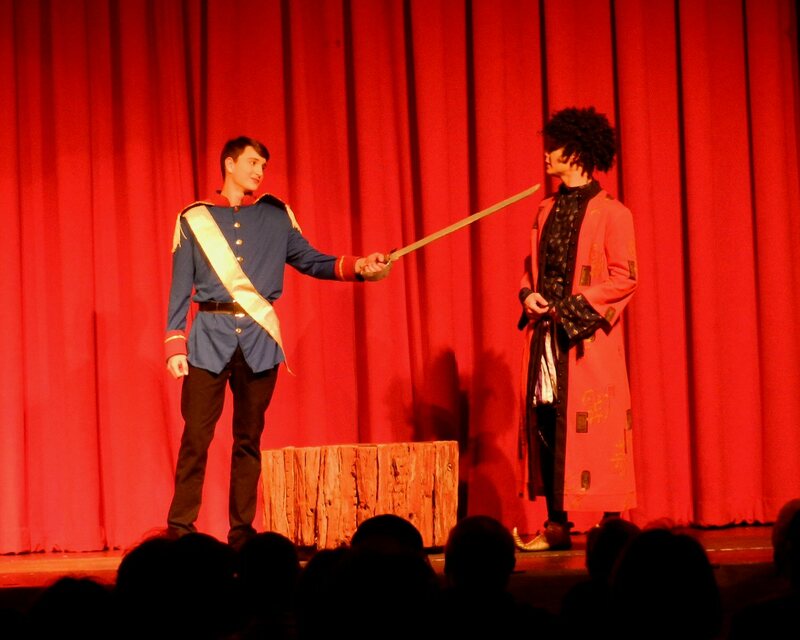 Elie Urlie dazzled the audience with his performance as an intriguing hip-hop style Rumpelstiltskin. 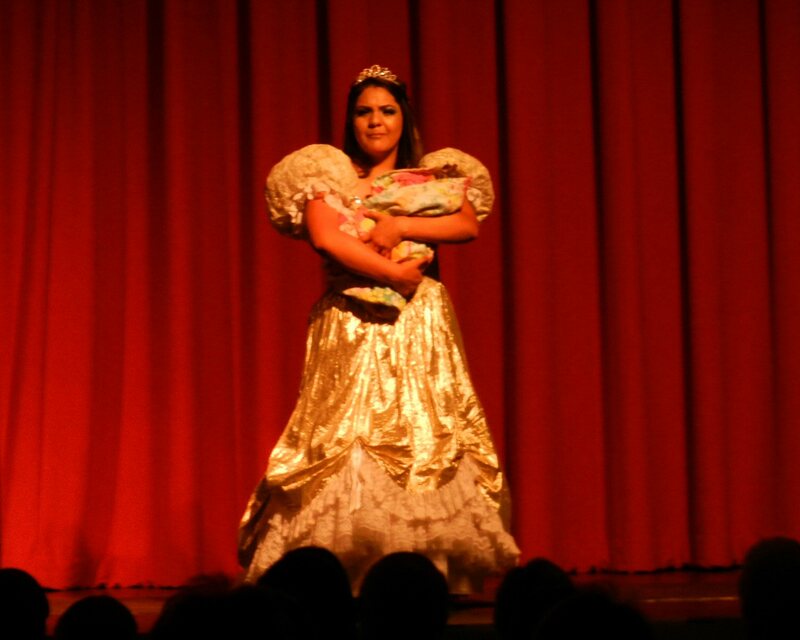 Paris Deaton-Geisler shone as a country-western style Snow White. 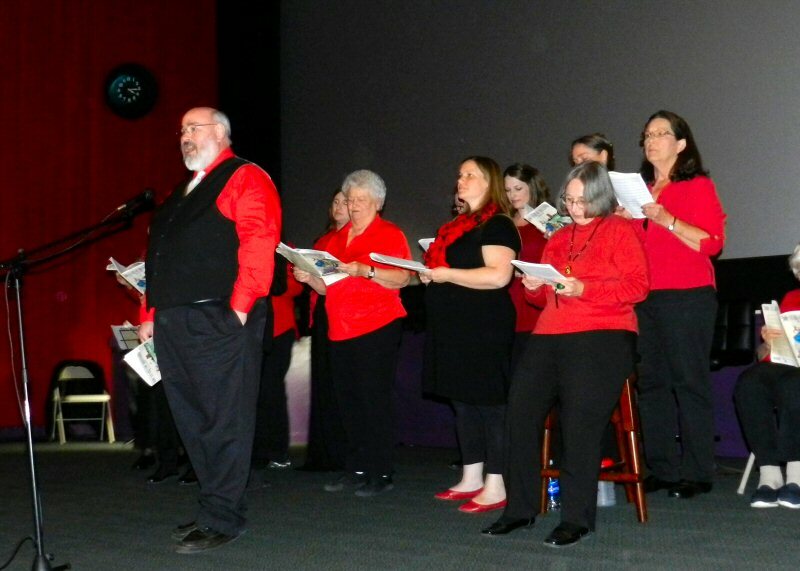 After the performance a special plaque was presented from the Mountain Echo newspaper with a photo and news article of the first chorale performance at Liz Polley Center. 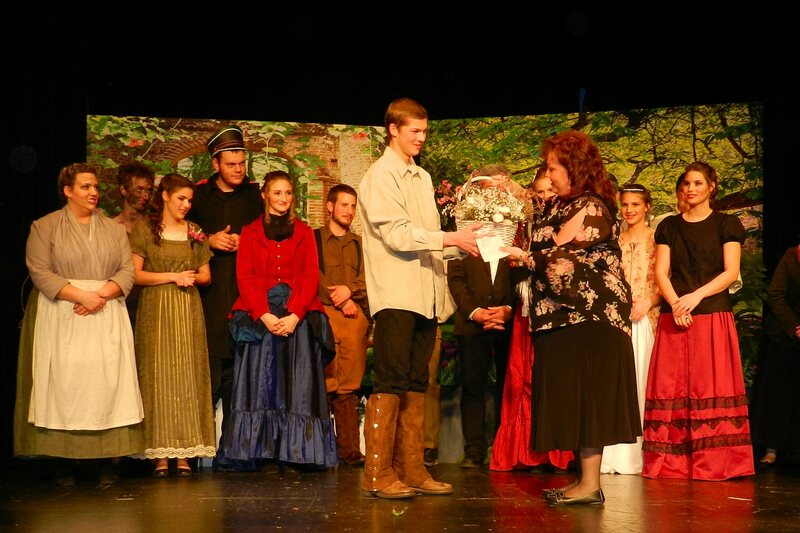 Ms. Reed then presented the students actors with gifts of appreciation for their hard work and excellent performance, and the students in turn presented gifts to Director Reed and Carolyn Garrigua expressing their love and gratitude. 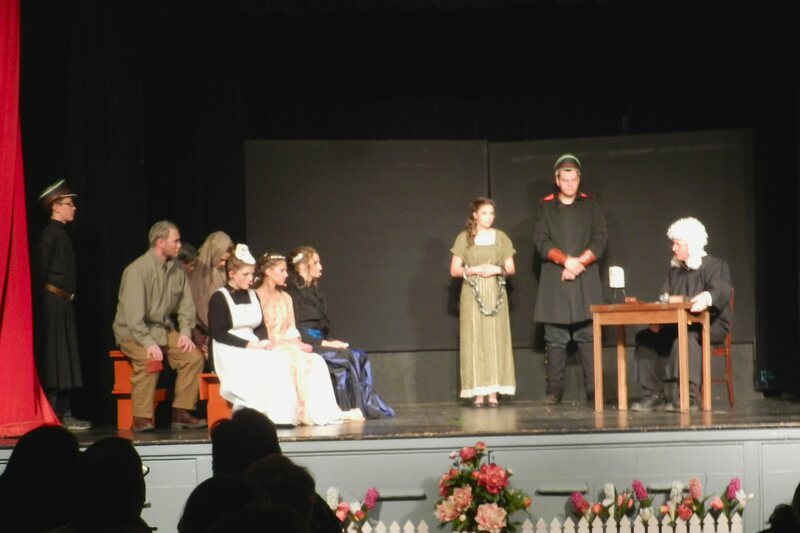 Grace Community Bible Church presented performances of “The Basket of Flowers” at the Liz Polley Center for the Performing Arts in Burney on February 9 and 10. 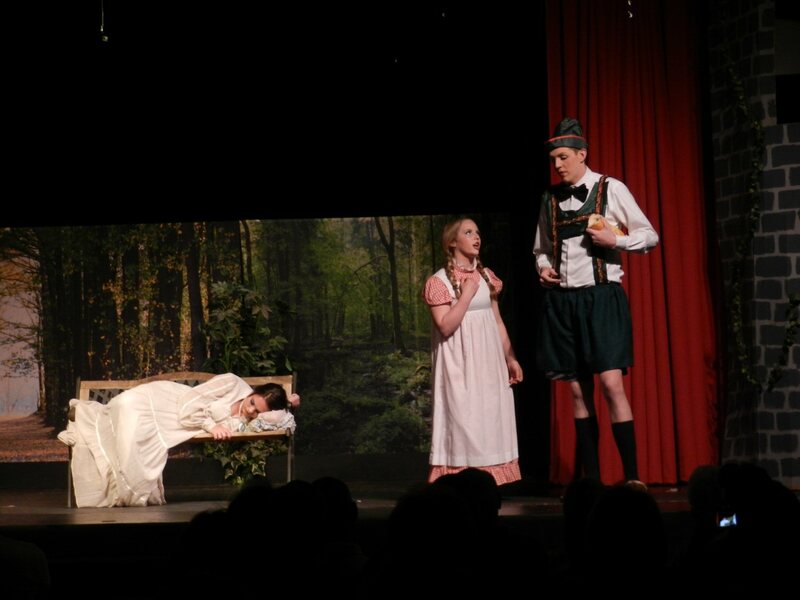 The play is a Lamplighter Theatre adaptation of a children’s story written by the 19th Century Bavarian cleric, teacher, and author, Christoph Von Schmid. 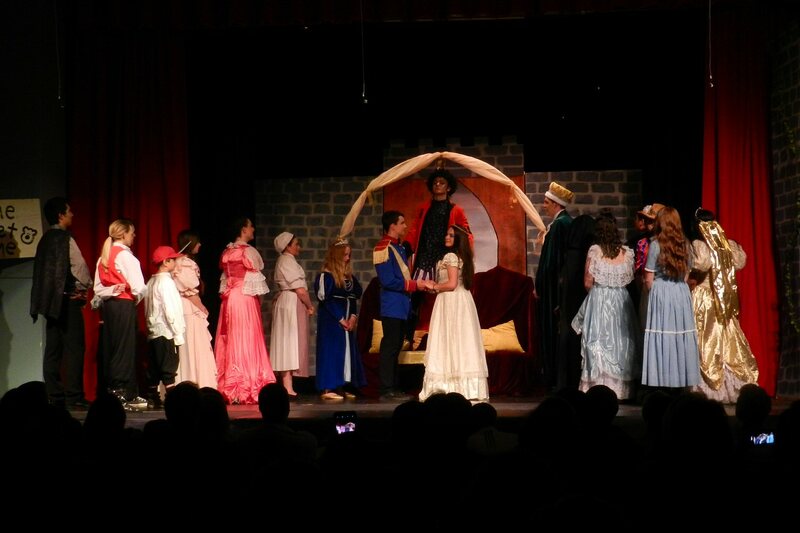 The Burney production was performed by a full cast of sixteen actors under the direction of Deborah Hathaway. 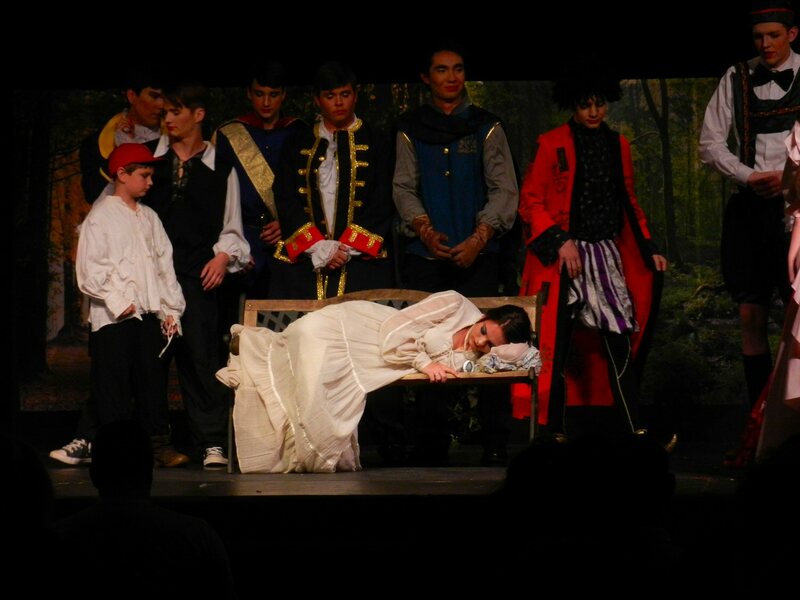 The tale tells the story of a fifteen year old girl named Mary, the daughter of the castle gardener. Her father is a humble pious man who uses the flowers to teach lessons of faith to his daughter. She is befriended by the daughter of the countess. After a visit to the castle, a diamond ring disappears and Mary is accused of stealing it and thrown into prison awaiting trial. 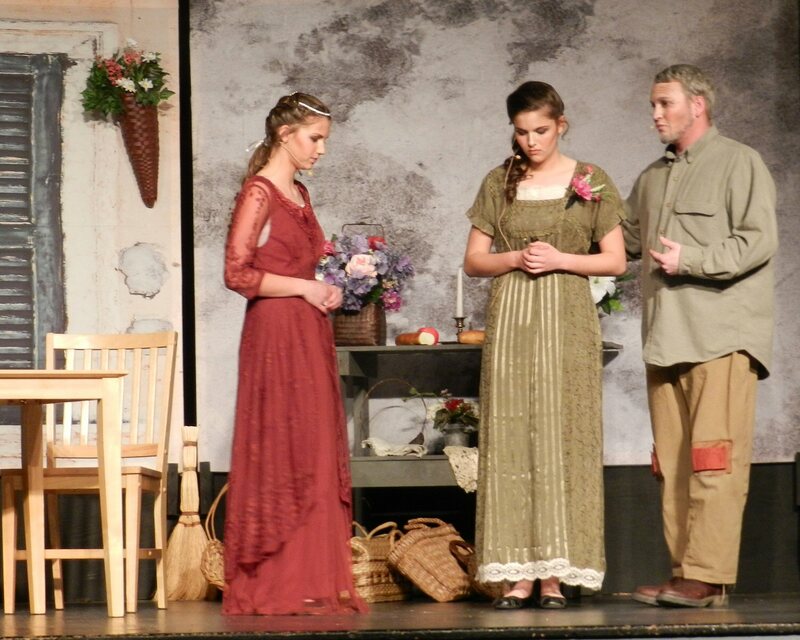 When Mary refuses to confess, her father is also arrested. 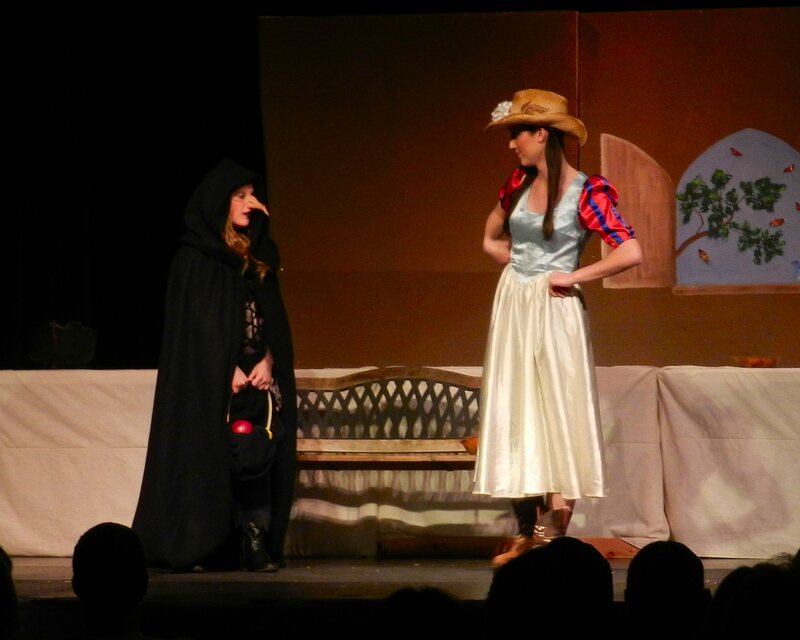 A jealous maid testifies that she saw Mary leaving the castle with the ring and the judge finds her guilty. The penalty for stealing from royalty is death. Thanks to the intercession of the Countess and her daughter, the lives of Mary and her father are spared. However, they are banished for life from the land. For over two years they wander homeless through the woods. When her father takes ill during a storm and lies unconscious under a bridge during a torrential storm, Mary finds a kind couple who takes them in and nurses her father to recovery. Eventually, Mary’s aging father dies as Mary reads him verses from the Bible. The couple with whom they stay are no longer able to maintain their farm and turn it over to their son and his wife. 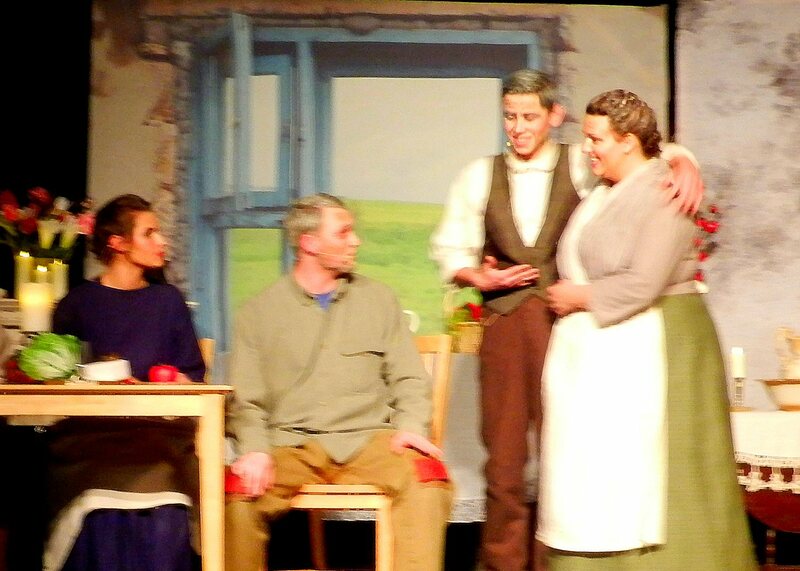 The daughter-in-law is a selfish domineering woman who puts Mary out on a cold dark night. In the meantime, however, the countess and her daughter have discovered the true cause of the disappearance of the ring. They set off to find Mary and in the end justice and mercy prevail. The faith of Mary’s father is vindicated. Before the final scene, Pastor Henry Winkelman, who played the judge, gave a short talk about forgiveness with an invitation to receive God’s love and mercy through faith in Jesus. The tale is told in beautiful language. Through the subplots, human nature, both good and bad is explored. 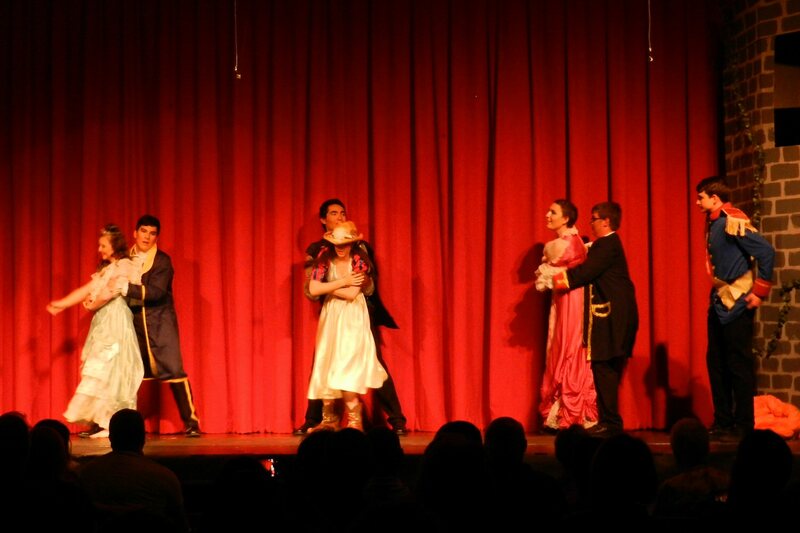 The character development portrayed by the actors was marvelous causing the audience to break into applause after numerous scenes. The lead character Mary was played by two actors. Young Mary was played by Savannah Niemeir. Older Mary was played by Trisha Niemeir. Her father James was played by Seth Landers. 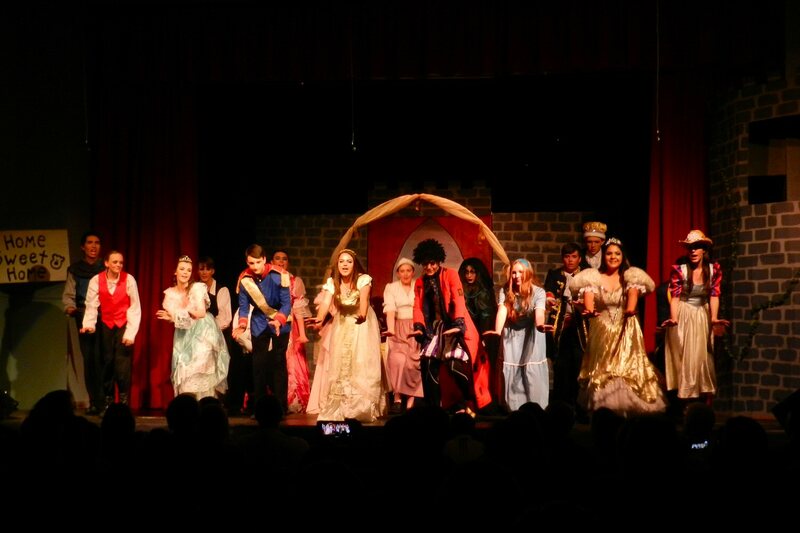 Other cast member were Brian Winkelman, Arden Hathaway, Millie Hathaway, Cierra Niemeir, Breanna Landers, Timothy Landers, Henry Winkelman, Stephen McDermeit, Kendra Hathaway, Zachary Paramo, Luke Niemeir, Brenda Hathaway, and Lydia Winkelman. 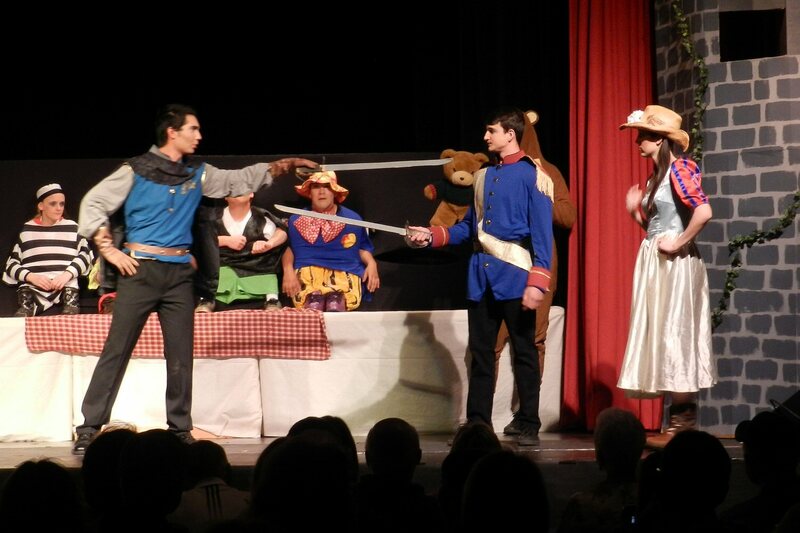 The entire drama was accompanied by a lovely musical score. 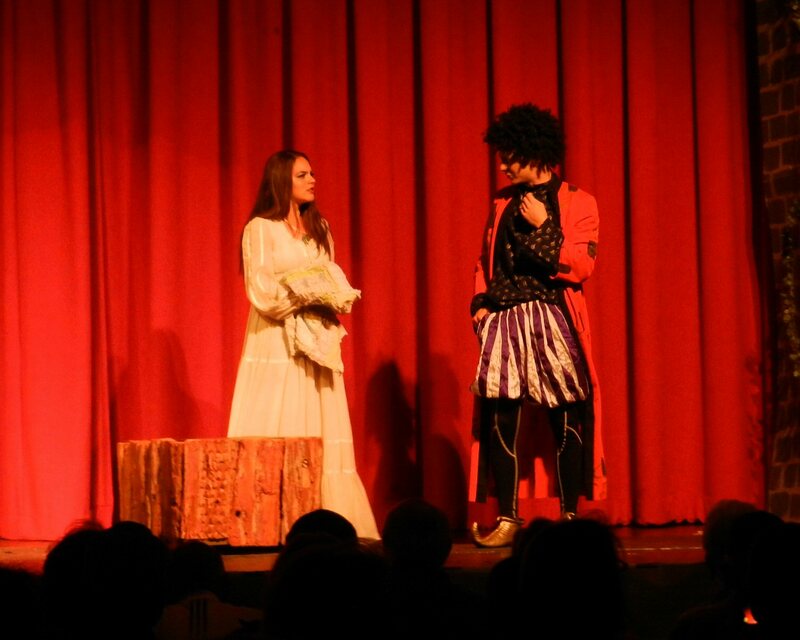 Hillary Fahey provided free access to the wardrobe closet at Shasta Community College to provide the actors with their marvelous costumes. 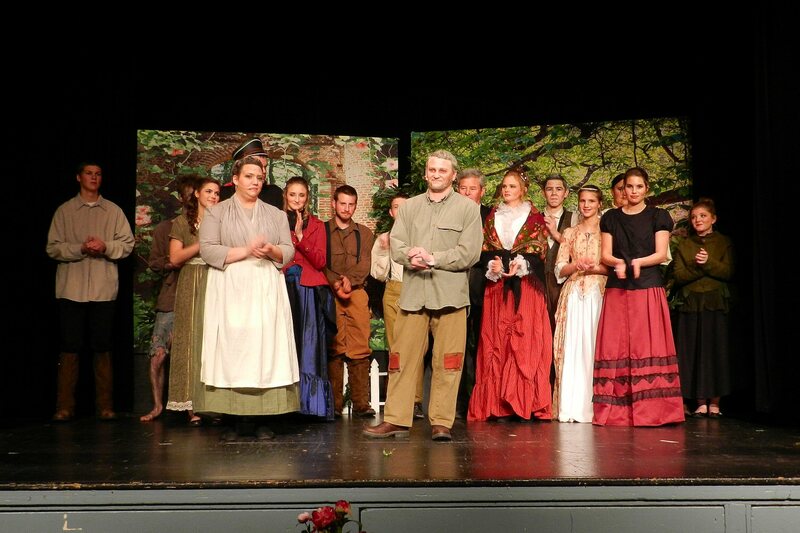 More than three dozen people contributed their time and talent working in various production teams to make the performance possible. The 12th Hope Is Alive! Open Mic Night will be held 6-8 p.m. Friday, October 6, 2017 at Billy’s Roadside Café, 30356 State Highway, 299 East, Montgomery Creek. Songwriters, musicians, poets, spoken word artists, storytellers, and dancers are welcome to come share their talent. Performers are encouraged to reserve a spot in advance by contacting Carrie Jo Diamond at 229-8484 or cdiamond@co.shasta.ca.us. This is the fourth Hope Is Alive! to be held in the Intermountain area of the county. Hope Is Alive! was founded in September 2014. The purpose has been to celebrate the healing power of art, music, and poetry and to raise awareness about mental health struggles, substance use disorders, and suicide loss. Hope Is Alive! 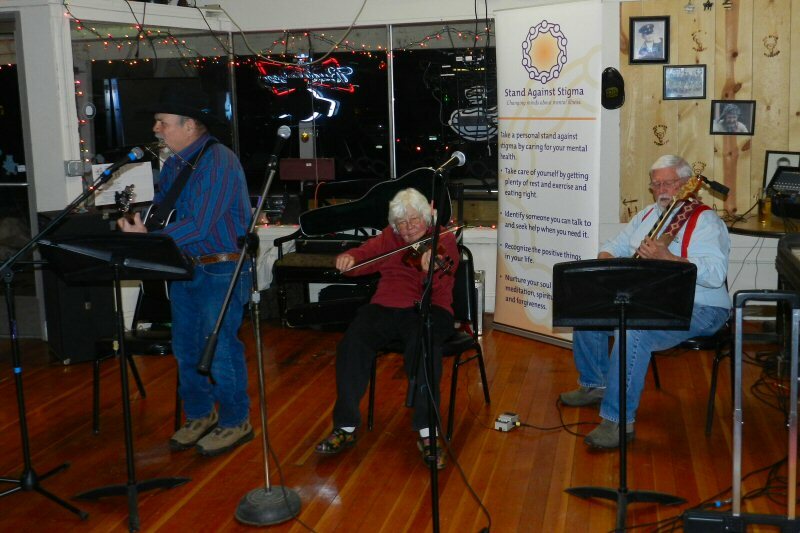 open mic nights have been held at locations throughout Shasta County. Nearly 130 performers, including dancers, spoken word artists, rappers and musicians have participated. For more information about Stand Against Stigma and Hope Is Alive! Open Mic Nights, visit www. Standagainststigma.com or Hope is Alive! 12 on Facebook. 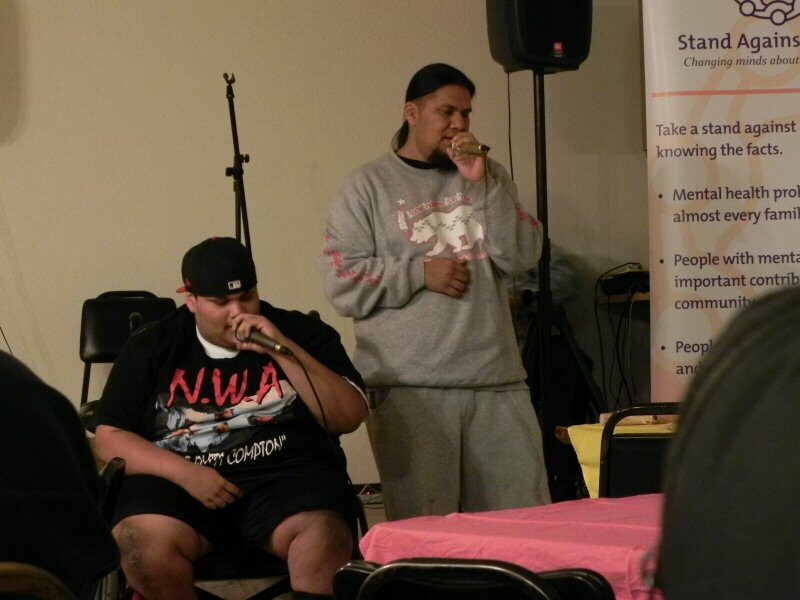 Open mic brings hope alive in Burney! 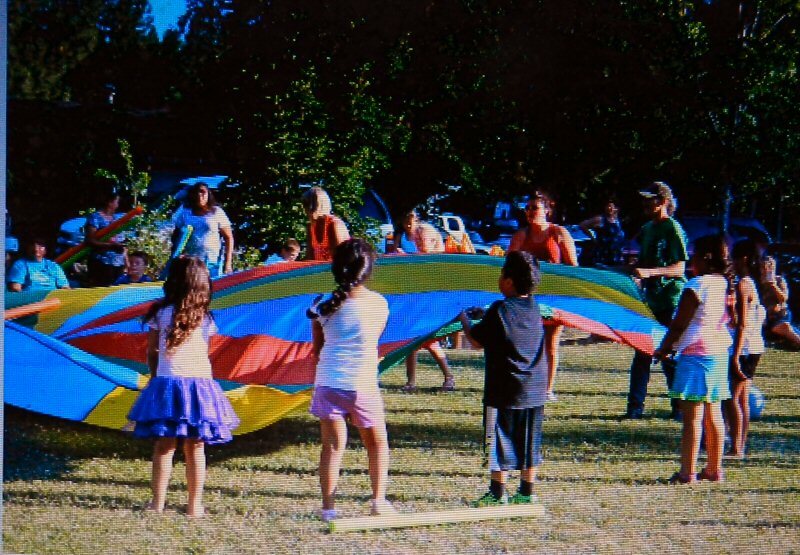 The Shasta Regional Community Foundation is a resource building organization in Shasta and Siskiyou counties dedicated to promoting philanthropy by connecting people who care with causes that matter. Since 2000, the Community Foundation has awarded over $18,000,000 in grants to area nonprofit organizations. 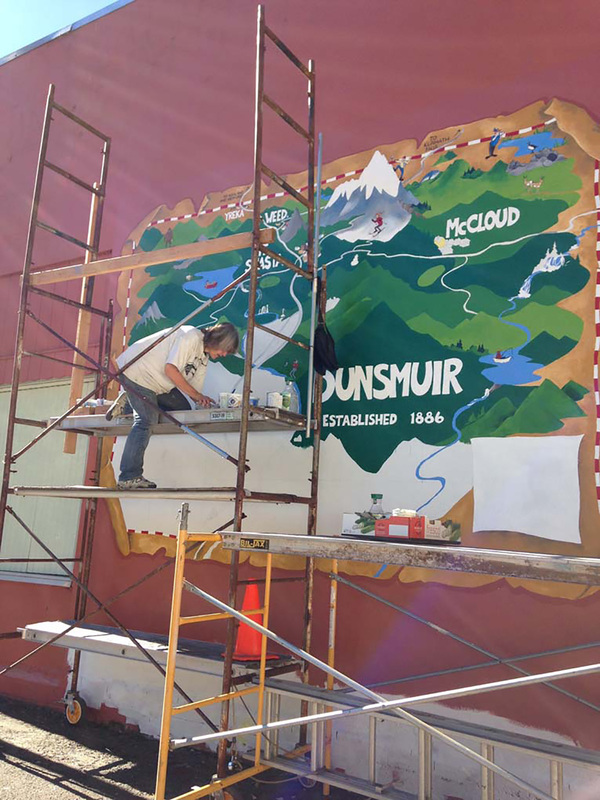 Artist Kim Solga received a grant to paint a prominent public mural in Dunsmuir celebrating the town’s heritage. 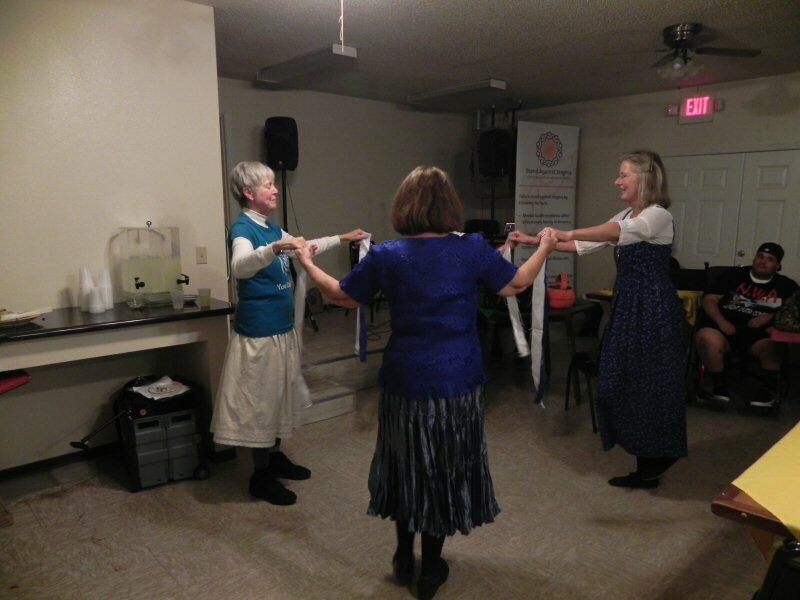 The deadline of June 7th is fast approaching for grant applications for funding from two field of interest funds managed by the Shasta Regional Community Foundation. These opportunities are provided thanks to the efforts and investments made by many generous donors in our region. 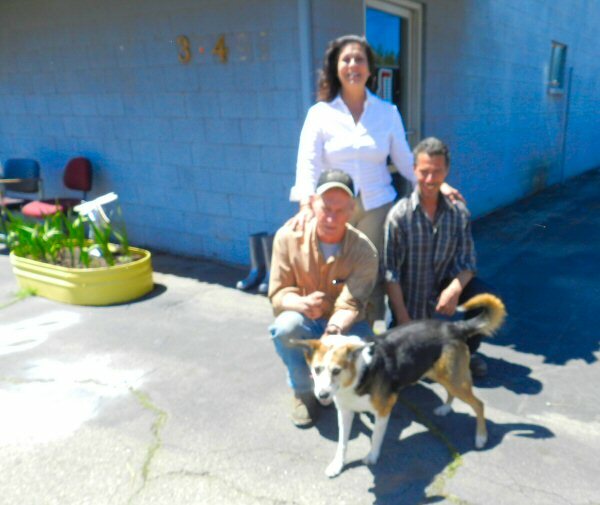 The Animal Welfare Endowment Fund was established in 2009 to benefit projects that will provide care for animals in Shasta and Siskiyou counties; the Community Arts Endowment Fund was established to support grants to nonprofits, public entities, and individual artists for the creation and presentation of new work in any media in the region. Grant review committee members from the areas served evaluate the proposals and make recommendations for funding. More details about making donations to or requesting funding from these and other funds are available on the Community Foundation’s website at www.shastarcf.org. For further information, contact Program Officer, Amanda Hutchings at amanda@shastarcf.org or call 530.244.1219. 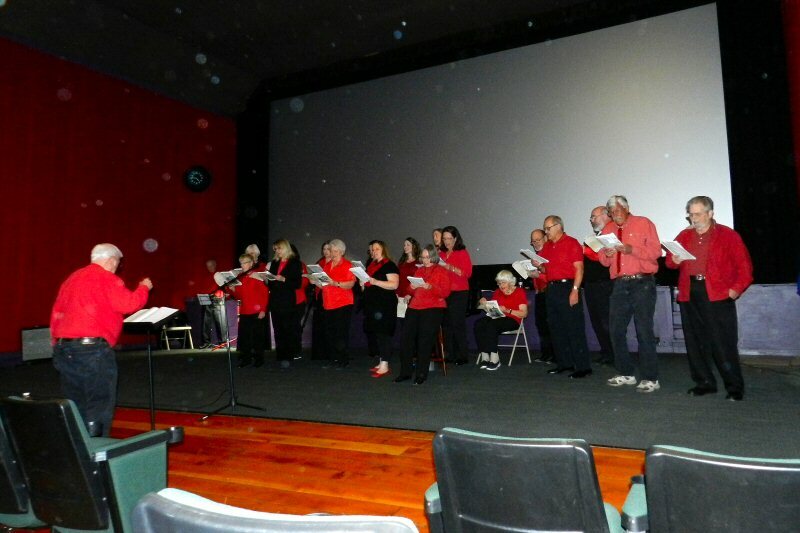 The Fall River Valley Community Choir performed “One Hundred Years of Broadway” at the Mt Burney Theatre on Saturday May 6. 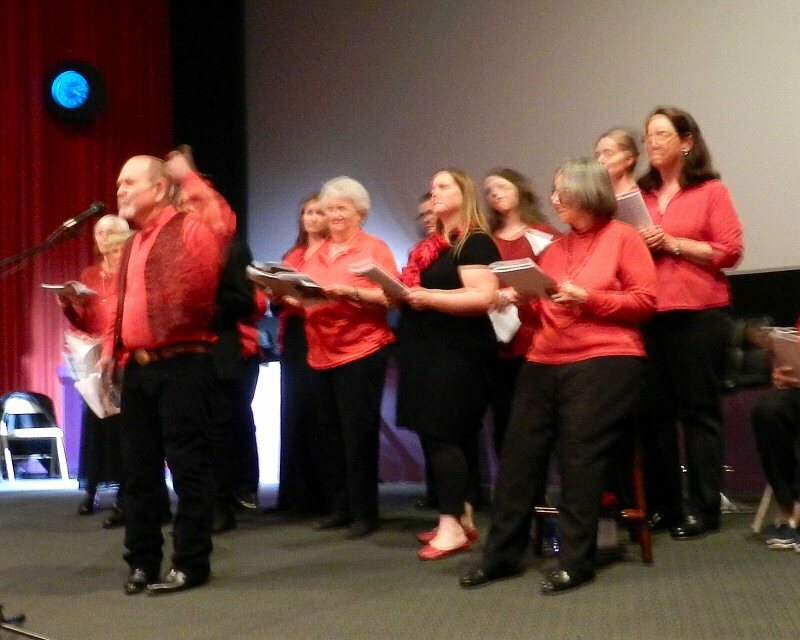 Eighteen choir members performed a medley of 50 Broadway hits ranging from the early days of Tin Pan Alley to state-of-the-art contemporary Broadway. Don Smith directed the choir for the 45 minute review arranged by Mac Huff. 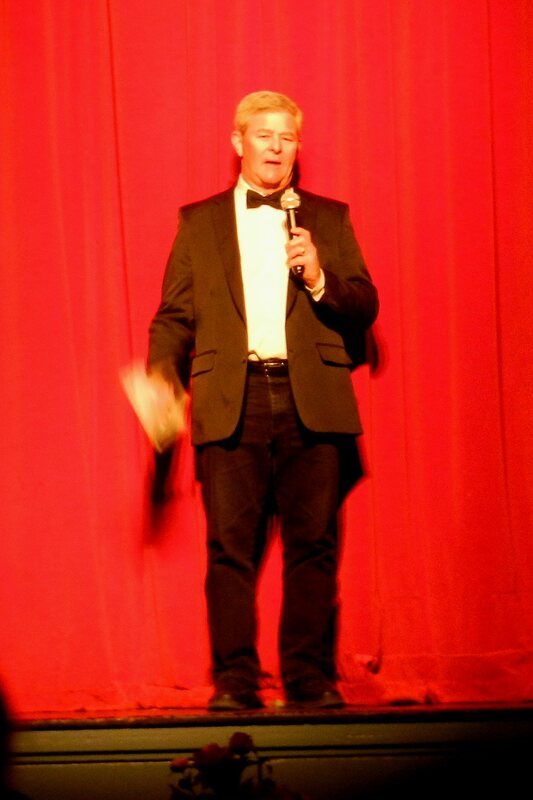 Narrator Michael Kerns guided the audience through the history as he introduced each of the six sections of the review. The Early Years featured music from Tin Pan Alley greats such as Irving Berlin and Cole Porter. Breaking New Ground rocked the hall with Stu Stoore’s soulful interpretation of “Jesus Christ Superstar.” Melanie Kerns moved the audience to tears as she sang Memory written for the 1981 musical Cats by Andrew Lloyd Webber and Trevor Nunn. 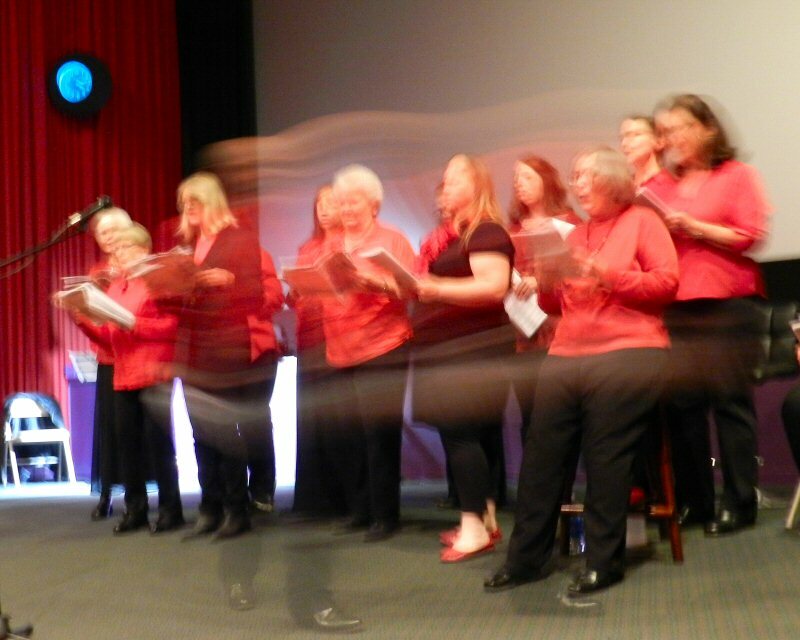 Then the choir concluded with a finale of more classic show tunes. Under the direction of Director Smith, the choir did a masterful mix of choral blending and individual performance. 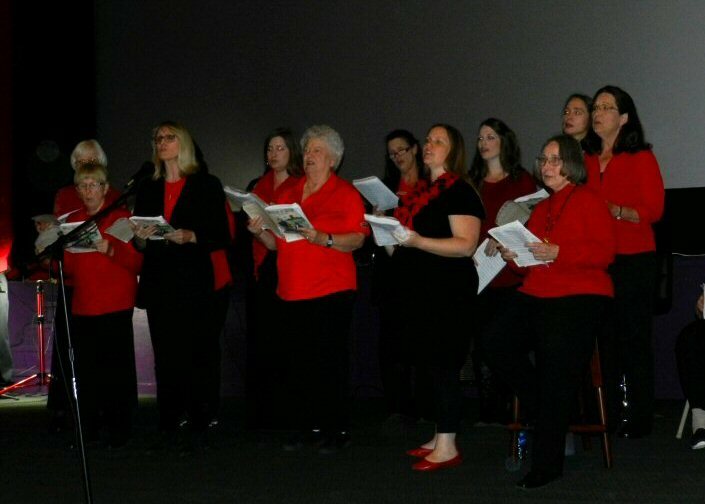 Laura Beyer, Melanie Kerns, Alison Maki, Candee Parker, Michael Martin, Penny Rogers, Lynn Stoore, Maggie Torres, Bill Myers, Stu Stoore, Brian Baddeley, Jean Rogers, and Tom Jones all sang solos. What a treat! 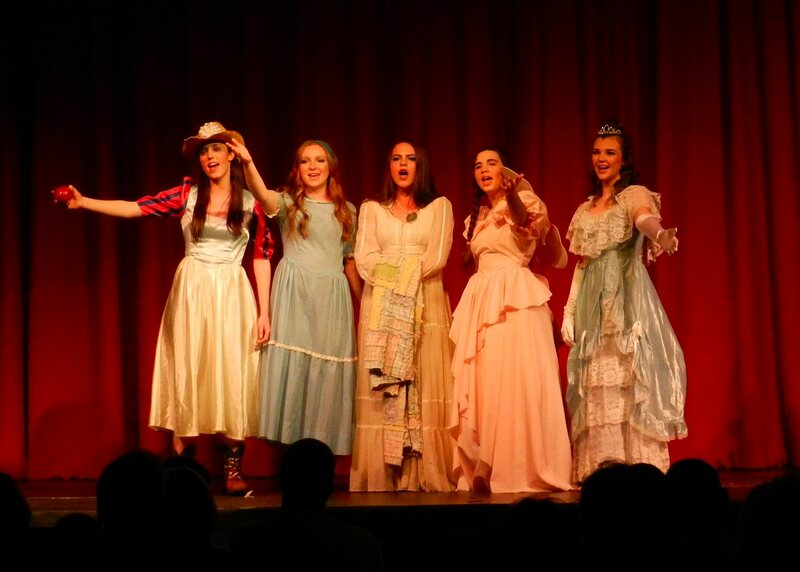 The spirit of Broadway definitely descended. 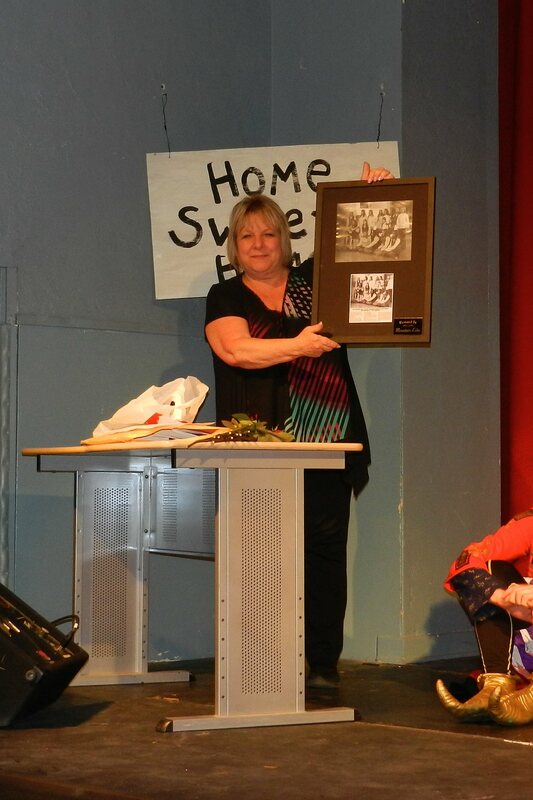 Special thanks to Donna Sylvester, owner of Mt Burney Theatre, for hosting the event. 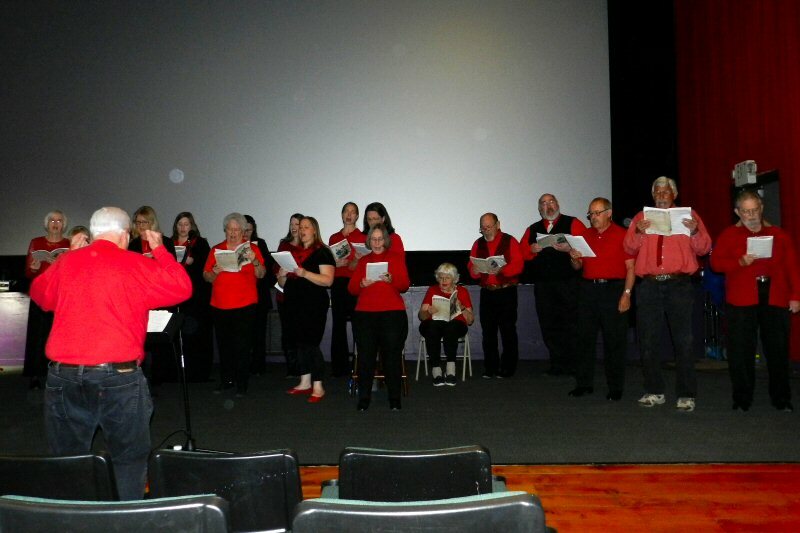 The Fall River Valley Community Choir will give another performance of the review on May 7 at Ingram Hall in McArthur at 4 p.m. and a shortened version at the Fall River Library on May 20. 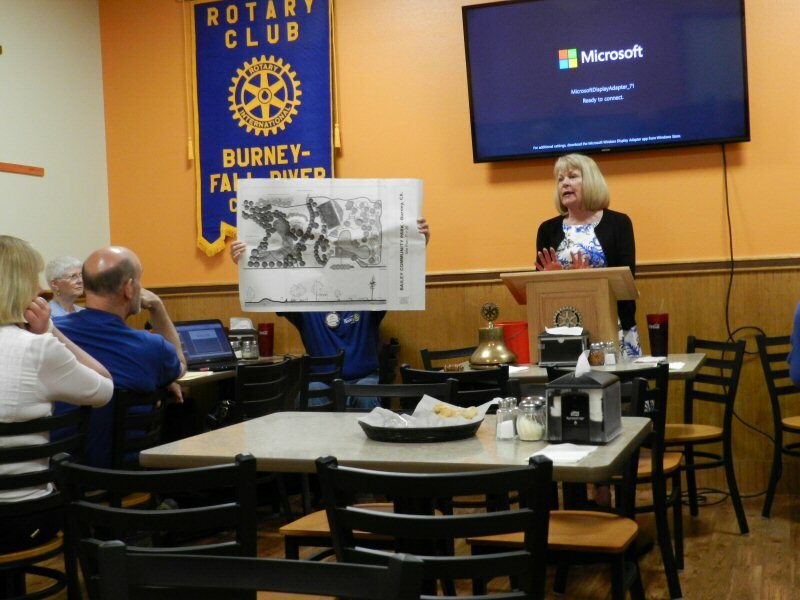 Cindy Dodds, Executive Director of the Tri County Community Network (TCCN), gave a fascinating talk on the history and current status of Bailey Park at the May 12 meeting of the Rotary Club of Burney-Fall River at Gepetto’s Pizza. Bailey Park is a true community park. 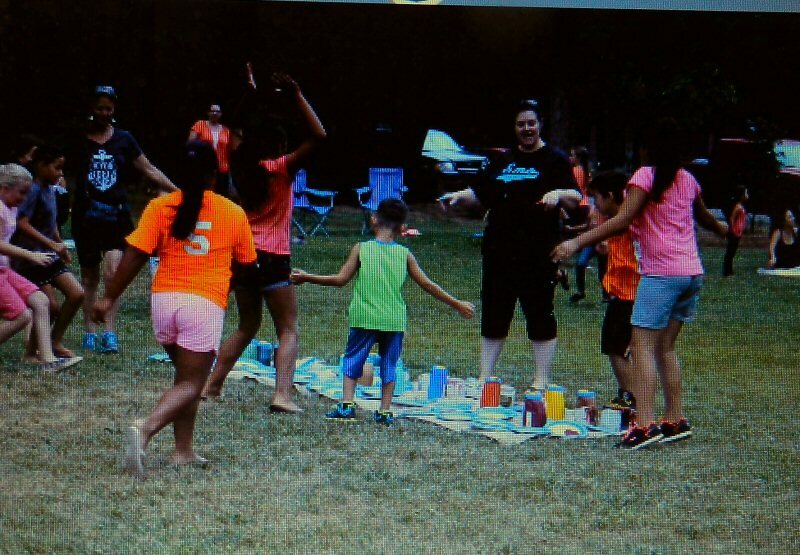 The idea for its creation was initiated by parents and children in the Burney community. Organization began in 2002. The park was designed by community members, supported by volunteer labor, and funded by $300,000 in community grants and contributions. Ms. Dobbs told interesting stories of the planning and development of the park. She brought a PowerPoint presentation with slides which she showed on her laptop. The following contains pictures of some of the slides in the presentation. The park opened to the public in 2003. One of its features is a 5000 sq. foot slab of concrete with a fun box for skateboarders. There is a grassy area of the park used for a variety of family activities in nice weather. 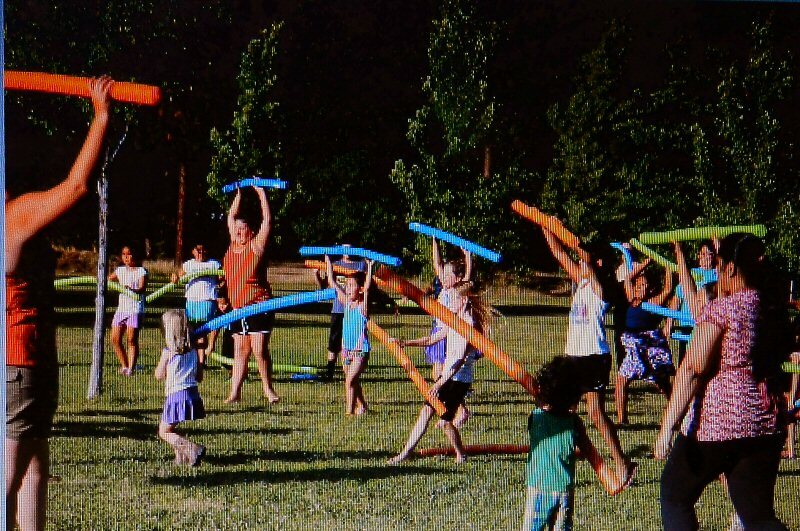 One of the past activities has been music and movement in the park. There has also been opportunity for parents and children to experience Art in the Park. 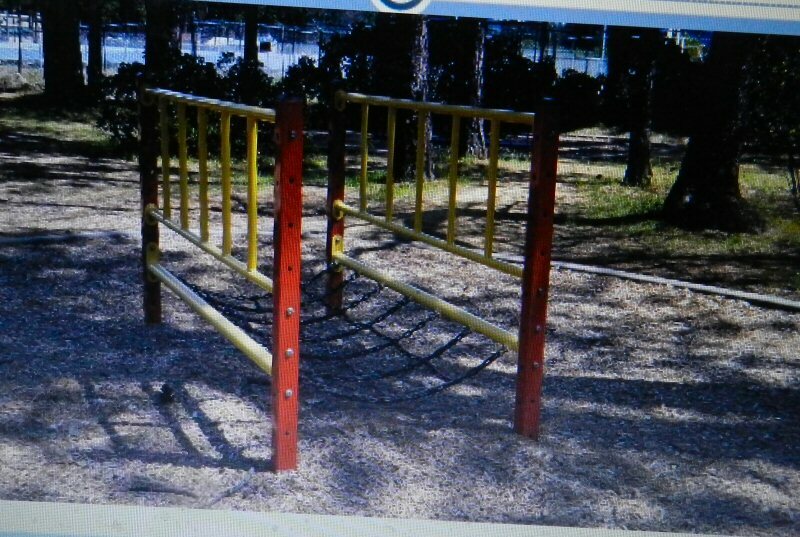 The park also contains a school-age fitness program with 9 stations designed by parents. The stations are all connected by trails. Because it is conveniently located near Burney Elementary School, the program is regularly used by BES teachers and students. One of the most popular features of Bailey Park is the Toddler Park that was designed by parents of young children. Many families hold birthday parties for their kids at the park. 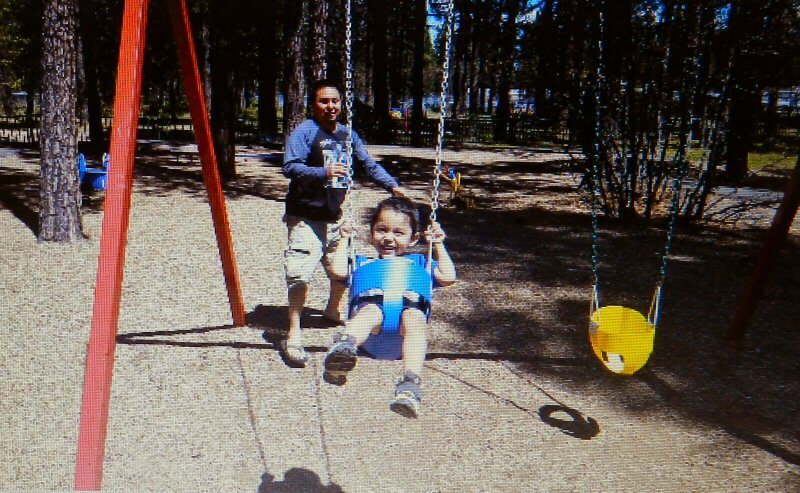 Also, lots of dads have enjoyed playing with their kids at the park. Annual maintenance for the park costs just under $3000. Each year TCCN has conducted a drive to raise the necessary money. During discussion following the presentation, questions were raised concerning the future sustainability of the park. 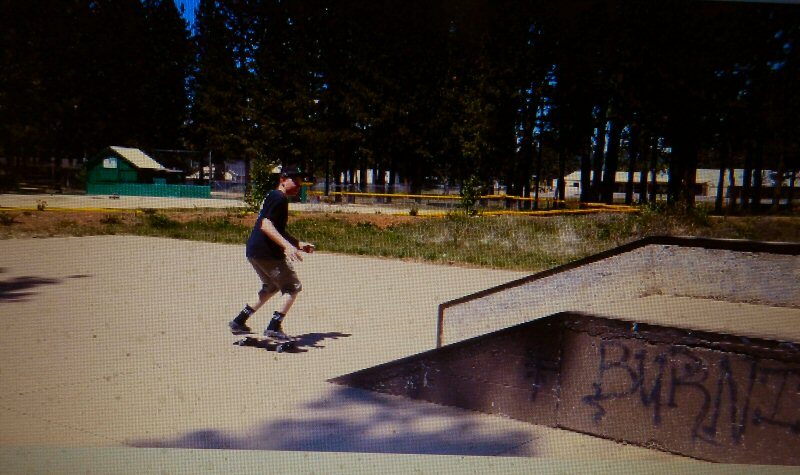 One idea mentioned was the creation of a Parks and Recreation District that would oversee all of the parks in Burney including Bailey, Washburn, and Lions Park. The Burney Water District actually has the authority to activate such a district. Another idea was the creation of a combined Community Services District to coordinate the activities of the various district service boards. This could possibly result in increased funding and more efficient use of equipment and other resources. We will see what the future holds. In the meantime, thanks to all of the volunteers who have helped to create and maintain a safe, secure, and inviting park for Burney families. A new business is opening in Burney! 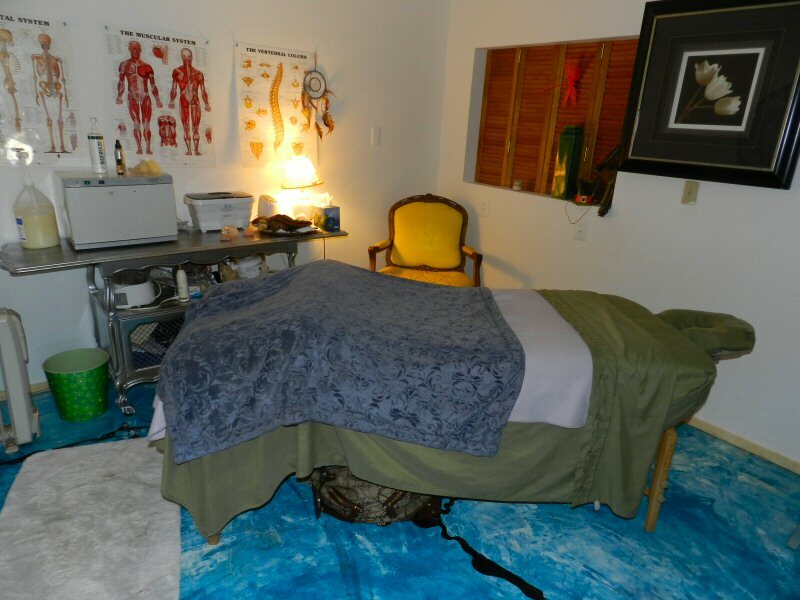 It is called Inter-Mountain Alchemy Arts. 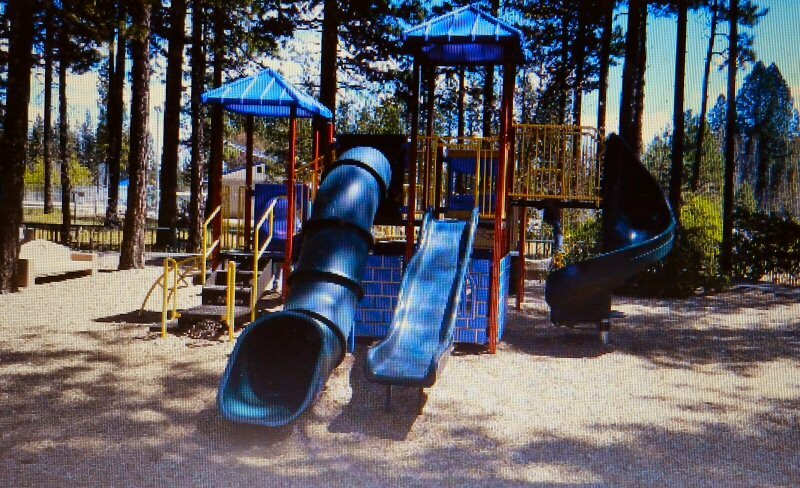 It is located at 37499 Main Street between Superior Avenue Steel Supply and Burney Disposal. The business is a collaborative venture by Christina Farber, Jeff McNeil and Shawn Lemmon to provide a variety of healing arts. metal arts, and electronic arts in the Intermountain area. The front part of the building has already opened to the public. 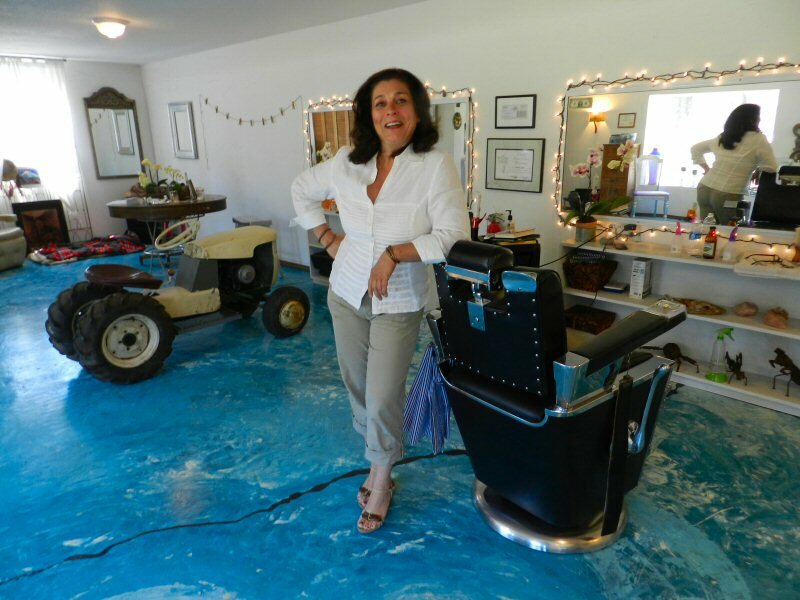 Christina Farber is providing hair-cuts and massage therapy. Men’s hair cuts and short-hair women’s cuts are $10. Kids’ cuts are also $10. If children are are 3-foot tall they can get their haircut on a small tractor. One-hour massage therapy is $39.99. In the back part of the building, Jeff McNeil is creating a sheet metal, welding, and blacksmith shop. Many people in the local area have met Jeff through his folksy western music. Jeff performed last year at the pre-fireworks program for Burney Basin Days. He has also played at the Rex Club and the Fall River Hotel. Most recently he entertained fishermen at the Fisherman’s breakfast in Old Station. Jeff has been a blacksmith for 30 years and a horseshoer for 25 years. He loves riding horses and was a trail and pack guide in the Sierras above Yosemite for many years. 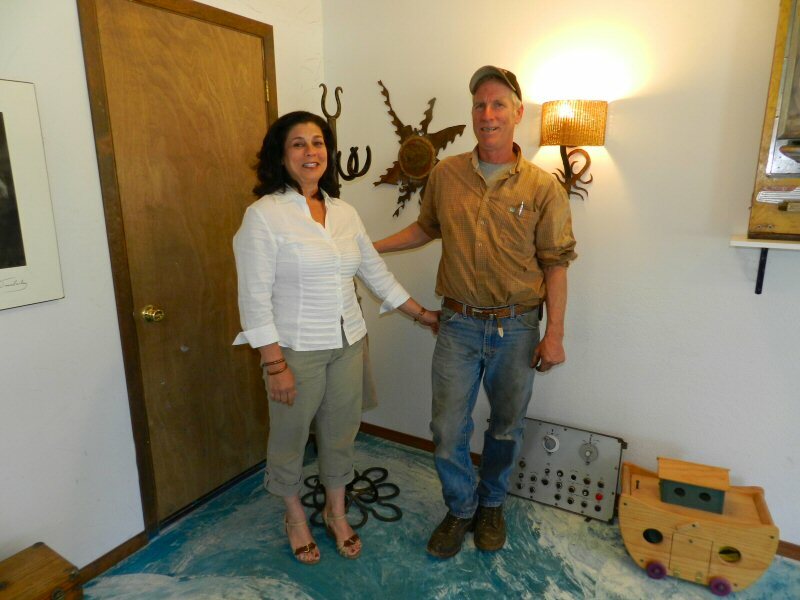 Jeff has a clever eye for metal sculpture and whimsy and likes to make art out of scrap metal. 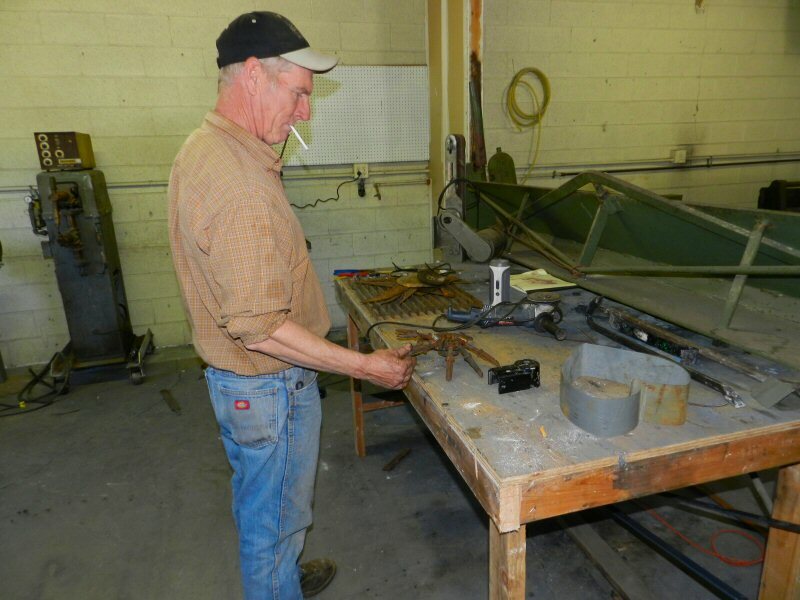 Jeff’s metal working shop and gallery is expected to be open by July, but in the meantime, you can visit and see some of Jeff’s work the front part of the building. The third component of Inter-Mountain Alchemy Arts will be located in the upstairs portion of the building. Shawn Lemmon has an electrical engineering degree from MIT. Shawn feels passionately about alternative energy and fixing computers is fun for him. Shawn is currently overseeing all of the clean-up and design of the building. He has also been tending a garden in front of the building that was planted to provide fresh vegetables and herbs for Pacific Crest Trail hikers and the community. Shawn’s office for electronic arts is expected to be open later this year. The theme of the business is “Transformational Energy and Beauty.” If you want to learn more, stop by or call Christina Farber at 650-283-4322. Business hours are Tuesday through Friday from 10 a.m. – 4 p.m., and on Saturday from 9 a.m. -2 p.m.